Mouth to nose lines or “nasolabial folds” are skin folds between the side of the nose and corner of the mouth. Nasolabial folds appear due to bone changes and the loss of fat in the upper outer cheeks. This results in loss of support for the skin on the cheeks causing it to sag thereby creating nasolabial folds. Other causes include age related weakening of facial muscles, loss of facial volume and collagen in the skin. Nasolabial folds can also be exacerbated by excessive weight loss, smoking, sun damage and excessive facial movement. At what age do nasolabial folds appear? Nasolabial folds can appear at any age. 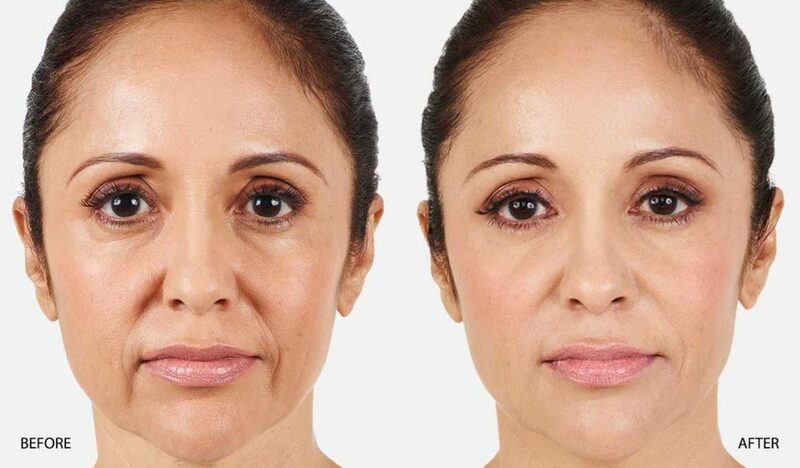 However, with age, the nasolabial folds become more pronounced. What can be done to stop them getting worse? In individuals who do not have deep nasolabial folds, facial muscle exercises may be beneficial. What are the non-surgical options for improving nasolabial folds? At Bedford Skin Clinic, we treat nasolabial folds through injecting dermal fillers such as Restylane, Restylane Perlane, Juvederm Ultra 3, Juvederm Ultra 4, Juvederm Ultra 4, Juvederm Volift and Radiesse. In clients with sagging cheeks, injecting dermal filler for a non-surgical mid-face lift will achieve optimal results. At Bedford Skin Clinic, we use Restylane Sub-Q, Juvederm Voluma and Radiesse for a non-surgical mid-face lift.